Today is Cinco de Mayo. I have no reason to celebrate this 'holiday.' No Mexican blood in my family. Not even any Central/South American blood in my family. Unless you count my sister-in-law, who is from Argentina. But her parents are descended from family who arrived in Argentina from Spain and France. I even looked up the holiday and read the Wikipedia entry (!) and I still don't really understand why it seems to be such a big deal these days here in the USA. I guess a lot of people want a really good excuse for a party filled with tequila and spicy food? Much like people with no Irish heritage celebrate St. Patrick's Day by drinking lots of green beer and people with no German heritage guzzle German beer & eat schnitzel during Oktoberfest. Anyway, last weekend when I was creating our food shopping list for the week, I was trying to think of quick meals since time is a precious and fleeting commodity these days. I was looking at some food sites for inspiration, realized Cinco de Mayo was coming up, thought of Mexican food, then thought of tacos, thought that tacos are one of SP's favorite dinners plus they are a quick meal for us and something we haven't had for quite a while, so, being a nice wife, I suggested tacos, much to SP's delight. I'll take this opportunity to remind my readers that it also was fish week (since tilapia cooks quickly). Fish + Mexican = not very exciting food week for Yum Yum. So I decided that we would make a dessert even though there's still half a cappuccino meltaway egg, a bag of goofs, and Stella Dora breakfast treats + almond toast cookies on the kitchen counter. One can never have too many desserts, right? 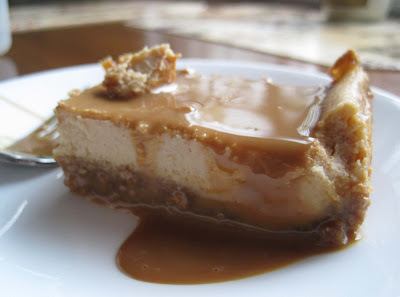 My choice: Dulce de Leche Cheesecake Bars. The recipe is from the June 2010 issue of Bon Appetit. 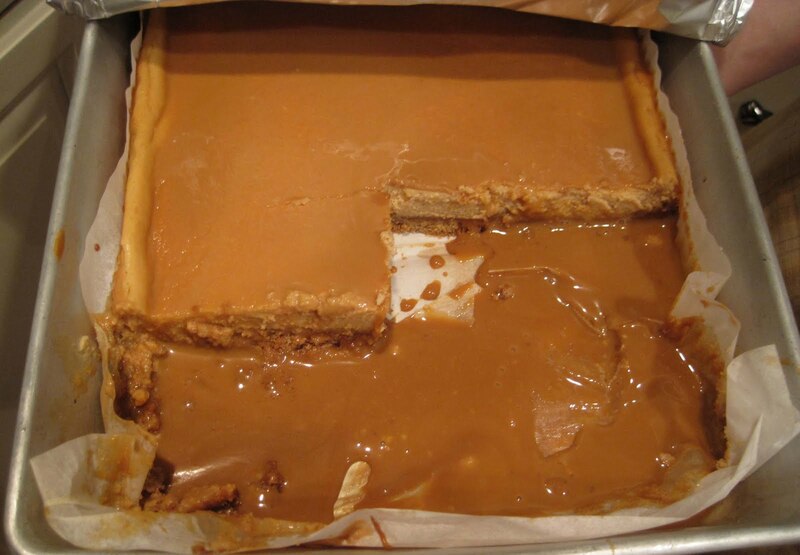 I first learned about dulce de leche when my brother starting dating his now-wife. As I said, she is from Argentina. 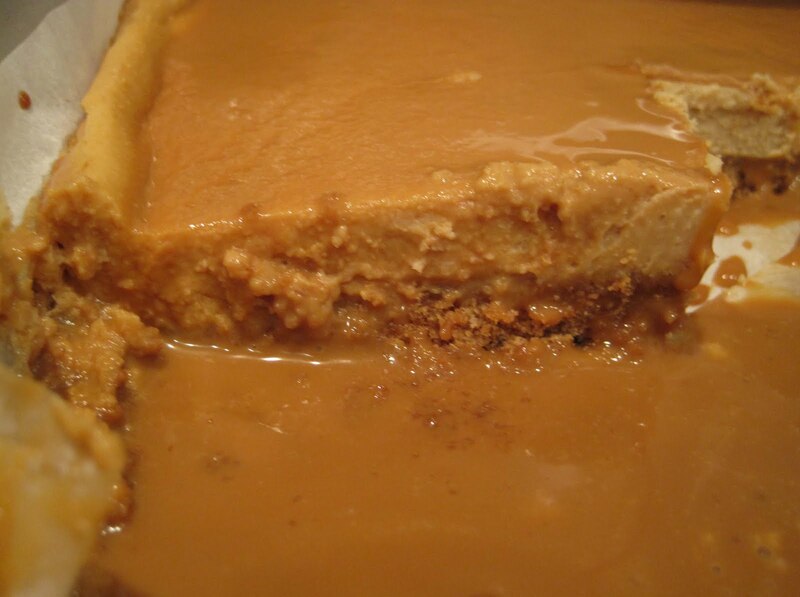 She introduced us to dulce de leche. 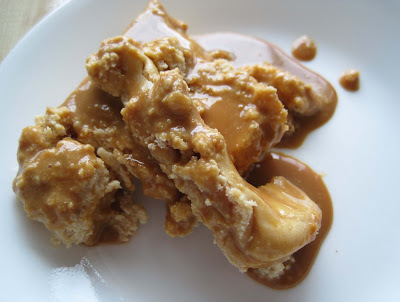 Many Americans simply equate dulce de leche with caramel, and so did I. I remember saying to her, oh dulce de leche, that's just caramel, right? She said no, not really. 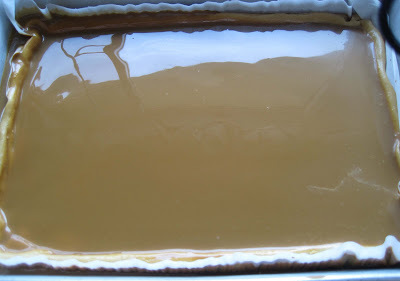 While it's very similar to caramel, it is different. I think the distinction is that caramel is sugar or sugar and water cooked until they caramelize while dulce de leche is a caramel like milk based sauce (heated milk & sugar). Things started off well. A tasty crust of graham crackers, cinnamon, sugar, and butter was baked in a parchment paper lined 13 x 9 baking pan. We don't have cooking spray, so I figured parchment would work just as well. 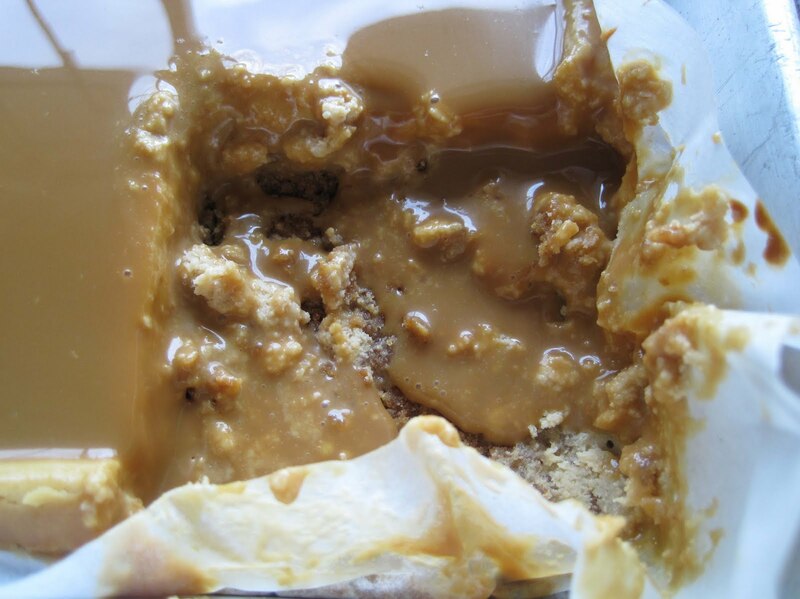 The filling mixed together quickly in the food processor (cream cheese, eggs, sugar, dulce de leche, and vanilla). It baked for 35 minutes and smelled yummy. We let it cool for a few hours while we watched Sunday night TV. 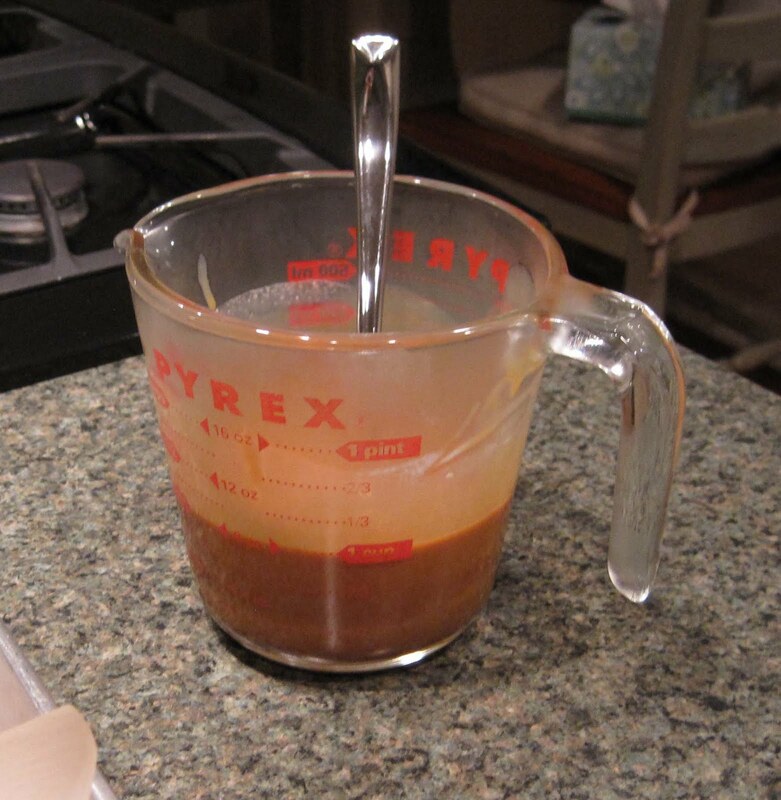 Right before bed, we poured the glaze on top. 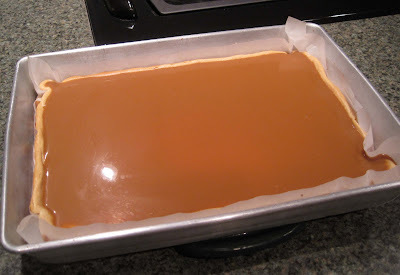 The glaze is a mixture of dulce de leche and whipping cream. So smooth and shiny and pretty. We covered it with foil, put it in the refrigerator, and went to bed. Monday afternoon, I decided I deserved a treat because... well, really just because I knew these bars were in the refrigerator and I just had to try one and see how they turned out. Here's what happens when the pan is somehow not sitting level on the refrigerator shelf: I thought at first it was stuck that way but a quick tilt revealed that it was not firmly set. I managed to cover everything evenly again. And then I set about cutting a piece. I took a deep breath and reminded myself that the first piece never comes out nicely, and therefore, would not be blog-worthy. 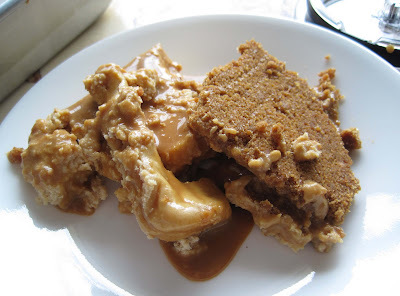 But I took a photo anyway: Mangled mess. Whoops. 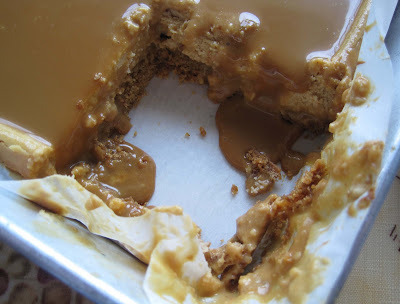 I hadn't cut clear through the graham crust and all my crust was still in the pan with glaze now pooling onto it: So I cut again, tugged up on the parchment a bit, and slid my spatula under again. 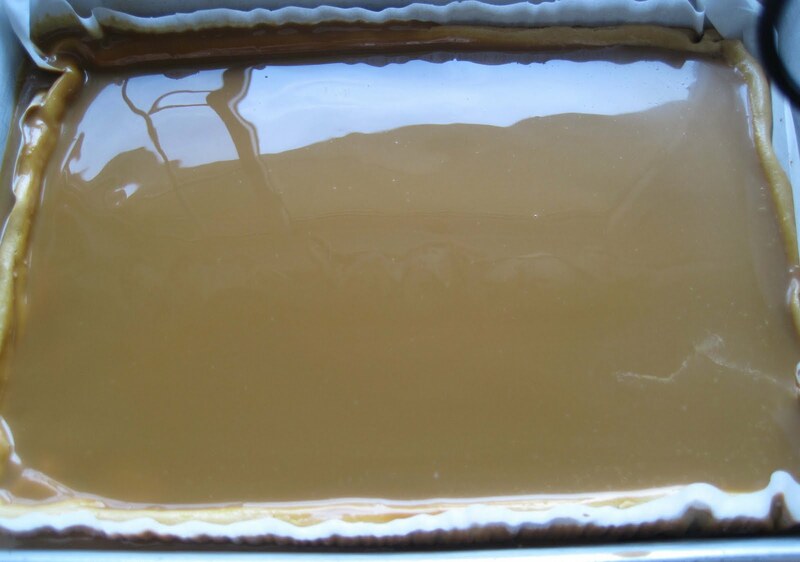 Here's the first piece with the crust plopped on top on the right: It looked neat in the pan - except for the pooling glaze. I covered the pan and put it back in the refrigerator. 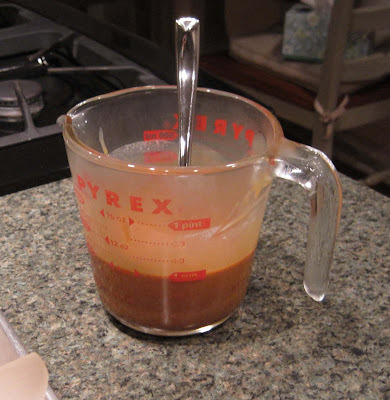 I consulted the recipe and discovered that the glaze is not supposed to be firm. But somehow I suspect it was supposed to be firmer than this: Yup. Oozing all over. 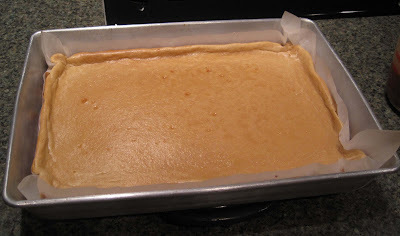 Thank goodness we used the parchment paper - I think it's helping to keep this from getting really messy. 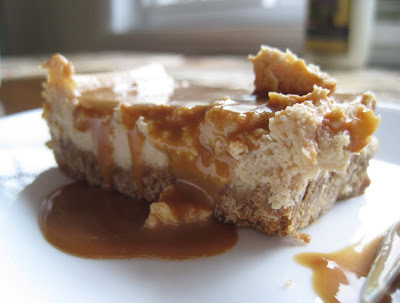 These are definitely cheesecake bars that require a fork when eating them. We've been cutting and placing a piece on a plate and then using a spoon to scoop up the pooled glaze and drizzle it over the cut piece. But it's still quite messy. And sticky. We've dripped dulce de leche glaze on the counters. Our laps. The new floor. Almost on the couch. 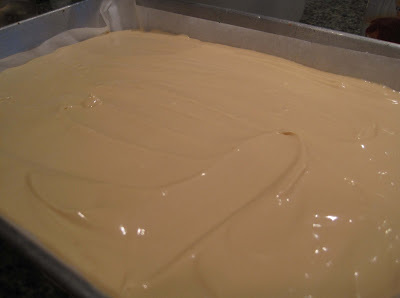 They're quite tasty, and I'm not opposed to making them again despite the sticky messiness. But the Bon Appetit photo makes it look like they can be cut and served on a plate like brownies. Their glaze is not running amok in their photos. Maybe we messed up the glaze and added too much whipping cream. It tastes fine, it's just really ooey and gooey and sticky and messy. 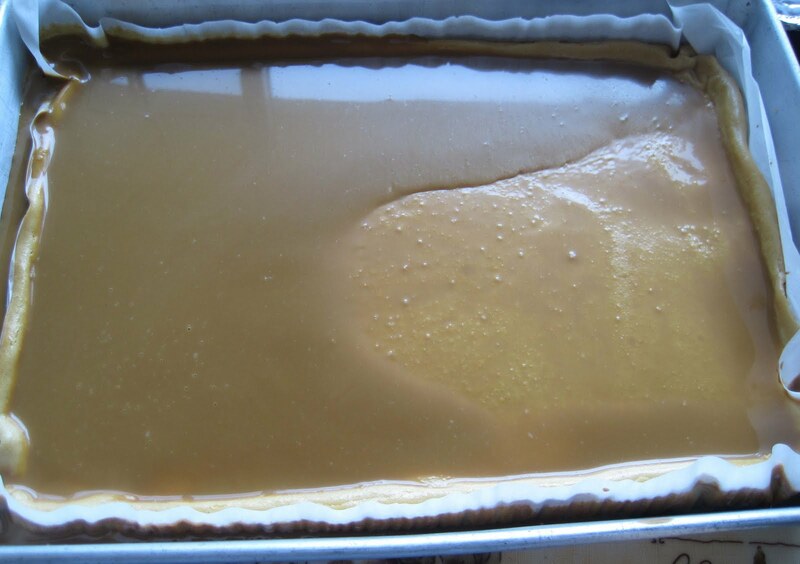 Next time, we'd like to try making our own dulce de leche. 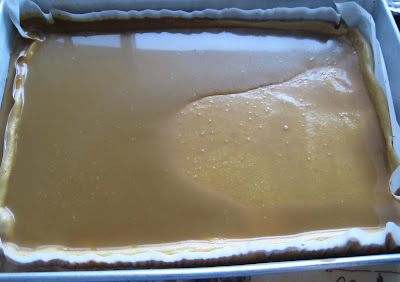 It's very easy, it just takes 2+ hours to simmer the can of sweetened condensed milk in boiling water until it turns into dulce de leche (and hopefully the can doesn't explode). Due to time constraints, we simply bought what we could find at Giant Eagle Market District. I've had better jarred, pre-made dulce de leche than what we ended up buying. Happy Cinco de Mayo - enjoy some margaritas and tacos/burritos/enchiladas! That looks AWESOME. I could use some of these treats in my life right now! !